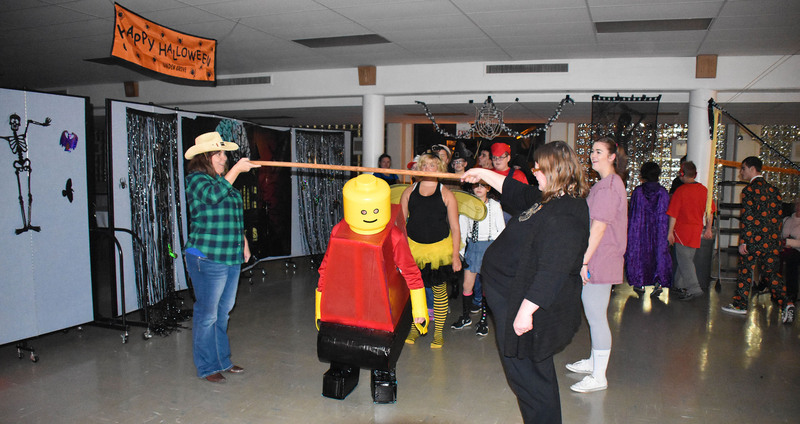 Halloween is the most anticipated celebrations of the fall season for the young and young at heart—and it’s no different at Linden Grove School. 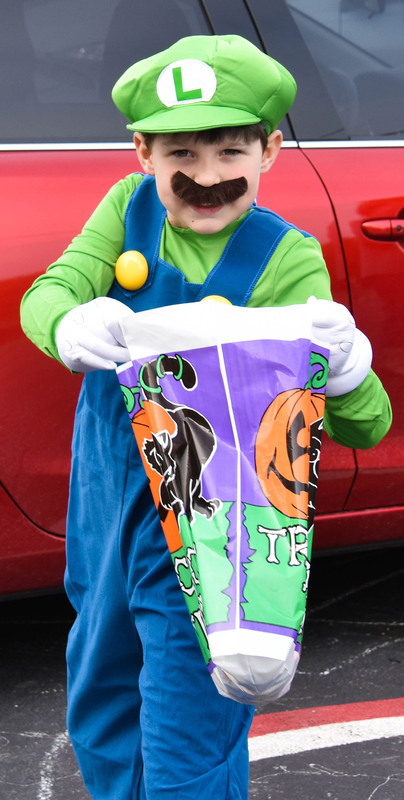 All October long we plan our costumes, stock up on candy and other treats, and get ready for a great time. 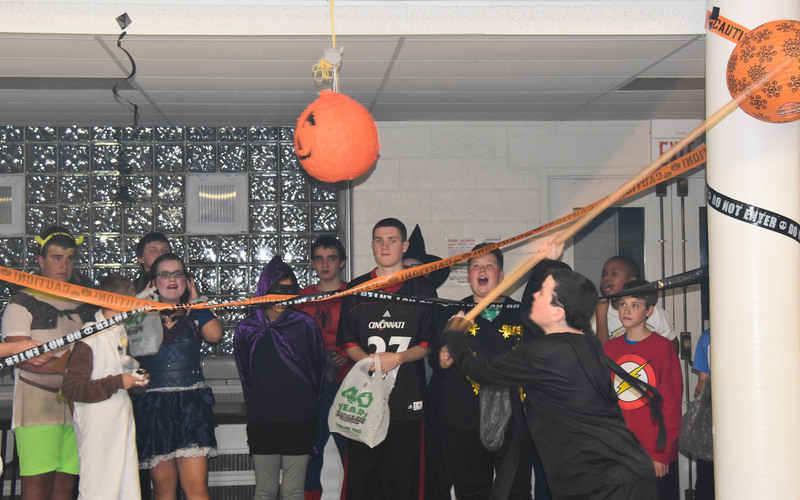 The annual 6-8 team Halloween Party is always fun and festive with a donut eating competition, games, candy, caramel apples, dancing, and the limbo. We were especially thrilled this year to see a number of LGS alums in attendance. 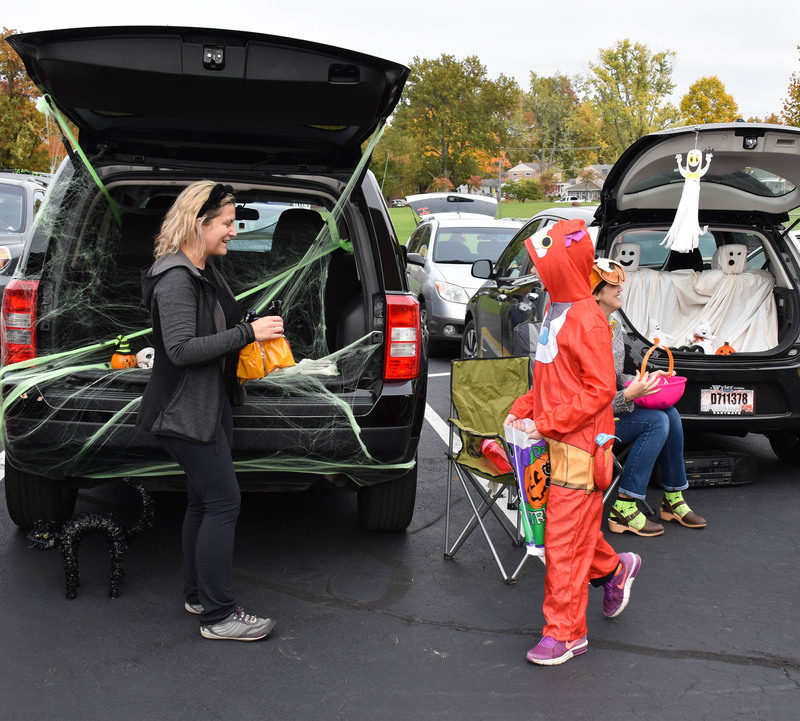 On Monday, Halloween Day, the mild weather allowed students to enjoy a “trunk and treat.” Students walked from car to car in our parking lot, gathering treats from LGS supporters. 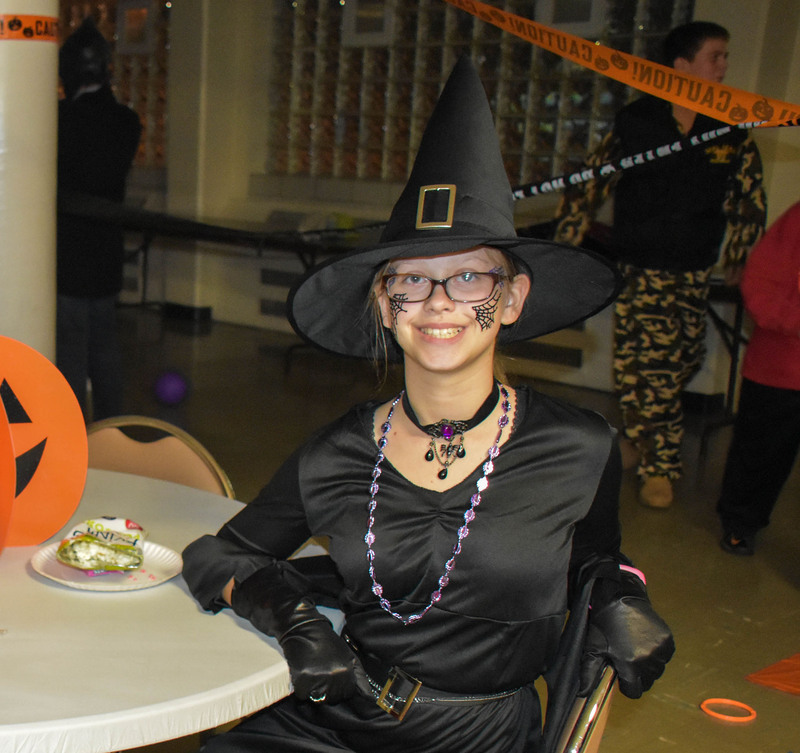 Many thanks to the to the parents and staff who worked hard to make this yet another great Halloween celebration for everyone at Linden Grove School. Now LGS students can earn, save and spend money on cars, toys, houses and more – just like their parents. All in the virtual world of Clay Piggy. 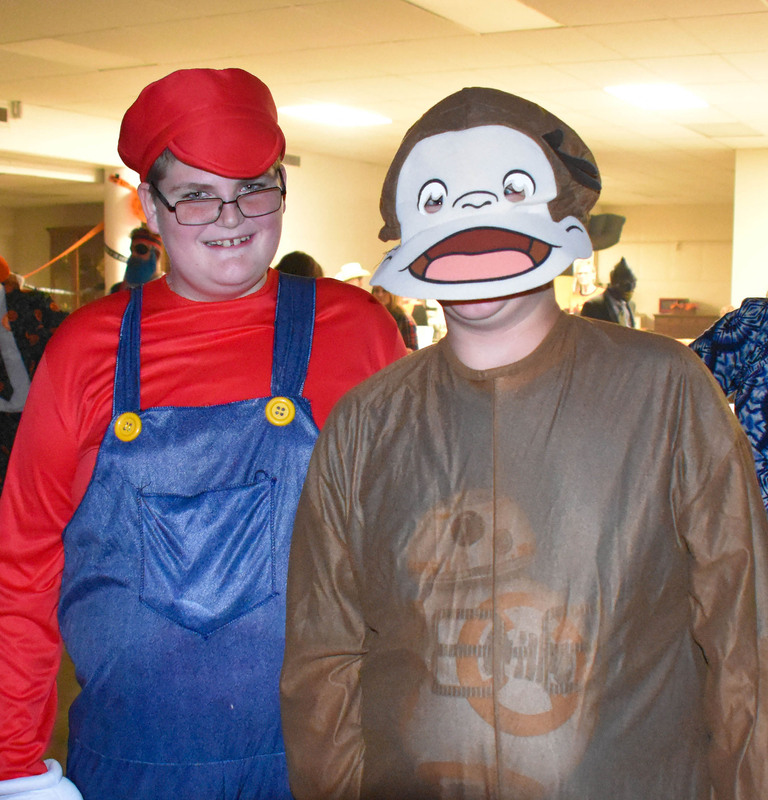 The Clay Piggy virtual gaming environment has stores looking to hire talented kids. Students apply for a job at a shop or company, and then begin earning money. The more they work the faster they get to the next level, and the higher the level the higher the income. Students can open checking and savings accounts, and learn how to write checks or use a debit card. Money is used for food, rent and buying cool things. 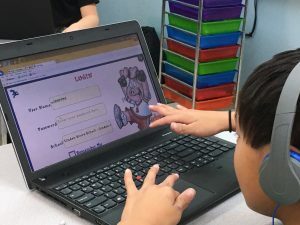 Students can also interact with each other in the virtual environment and travel together to the amusement park or other places – using the money they worked hard to earn! 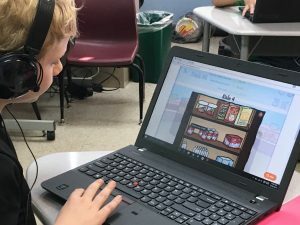 Once logged in, students choose a career and then can use their earnings to shop. 4-6 Team Teacher Leah Kubachka helps Jack Peak navigate the virtual world of Clay Piggy. 4-6 Team Teacher Leah Kubachka helps Liam Light navigate the virtual world of Clay Piggy. Liam Light browses a Clay Piggy virtual store for food and other items. A series of exercises executed by tossing bean bags or bouncing balls in a steady rhythm. Increased confidence and self-discipline – Impulsivity decreases and attention spans increase. Physical coordination and body rhythm are enhanced. Stress is more easily managed. Visual fitness improves – Eye tracking and focused attention improve, which accelerate classroom study, homework and test-taking performance. Auditory skills are enhanced – Rhythmic patterns stimulate a new awareness of the nuances of sound. Listening and communication skills improve. 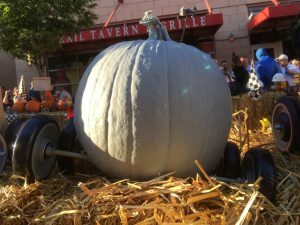 Bal-A-Viz-X has been utilized selectively at Linden Grove School in the past, but beginning in the 2016-2017 school year will be fully incorporated into the curriculum. 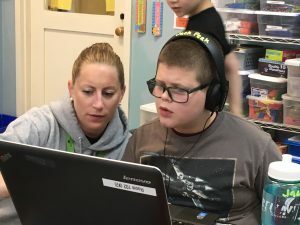 With the addition of a full-time Sensory Coordinator – the only position of its kind in the Greater Cincinnati area and likely in the nation – we will able to work with small groups of students and even one-on-one to achieve results more quickly. 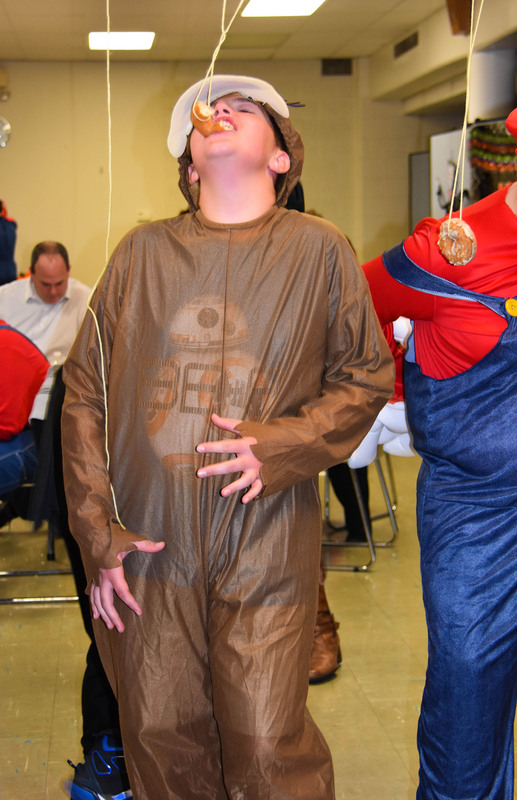 Watch the videos below to see our students demonstrate examples of Bal-A-Vix-X exercise. 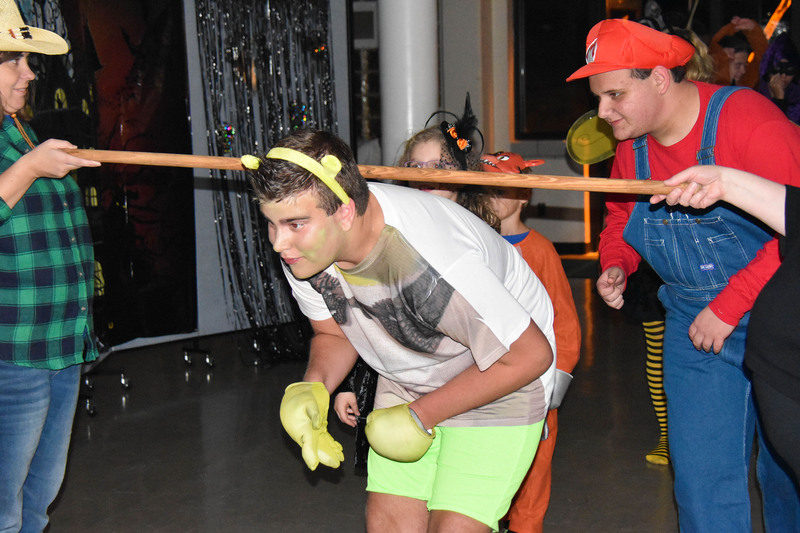 Students traveled back in time to explore the creative genius of Leonardo da Vinci hands-on. 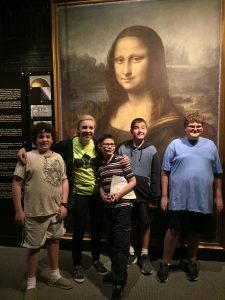 On a field trip to the Da Vinci exhibit at the Cincinnati Museum Center, our team of students and staff from grades 6 through 8 explored life-size reproductions of dozens of Da Vinci’s inventions ranging from a flying machine to a deep-water diving suit. 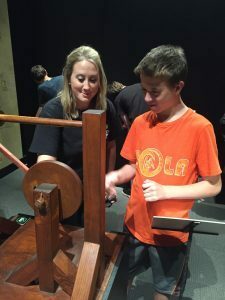 Wooden machines created opportunities to learn about the science behind Da Vinci’s inventions with chances to push, pull, crank and spin. And an animated analysis of Da Vinci’s most famous painting “Mona Lisa” brought the Renaissance to life. No exhibit Da Vinci would be complete without the Mona Lisa (not actual size!) 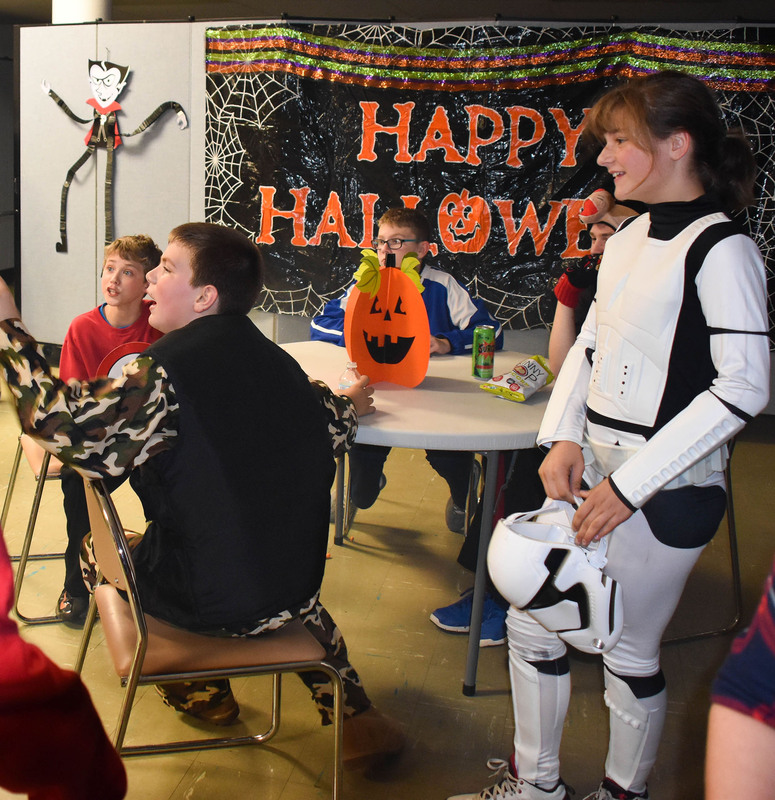 Shown left to right: Max Siekman, Lindsey Parker, Max Steinberg, Brendon Sears, Caleb Smith. Kiely Boone lends a hand to Avery Schonberg at one of the many hands-on exhibits. 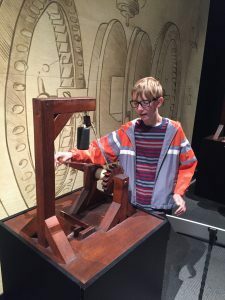 Max Rauch activates a wooden machine explaining the science behind Da Vinci’s inventions. 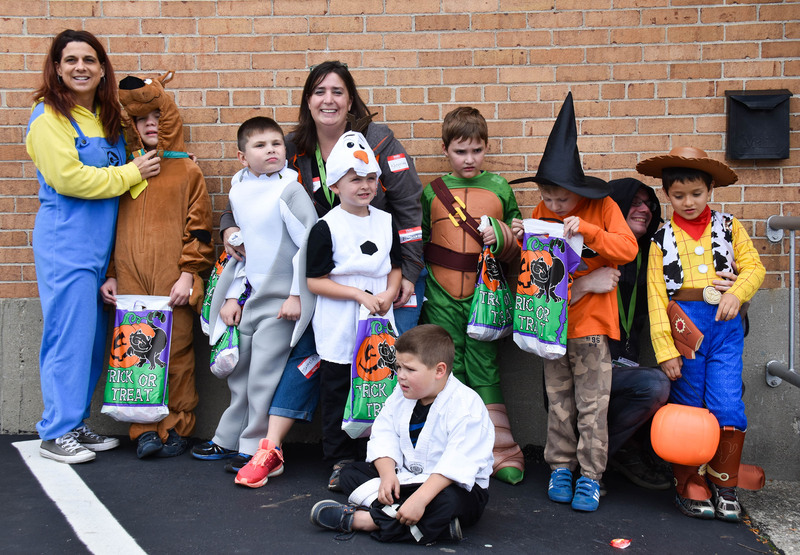 Linden Grove School was one of the many teams who joined in the friendly—and often hilarious—competition of The Great Pumpkin Race 2016 to benefit the Autism Society of Greater Cincinnati. Thank you to all of our friends and supporters who came down to the Holy Grail near Great American Ballpark to cheer us on and share in the fun! 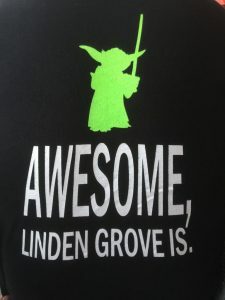 At the beginning of each school year, and throughout the year as well, Linden Grove School focuses on creating a community that CARES—a community where students and staff practice and develop the social skills of Cooperation, Acceptance, Responsibility, Empathy and Self-Control. To get us started, each week in September we focus on a new letter and the skill associated with it. At an all-school assembly on Friday, student teams share what they learned that week about what demonstrates that particular skill. 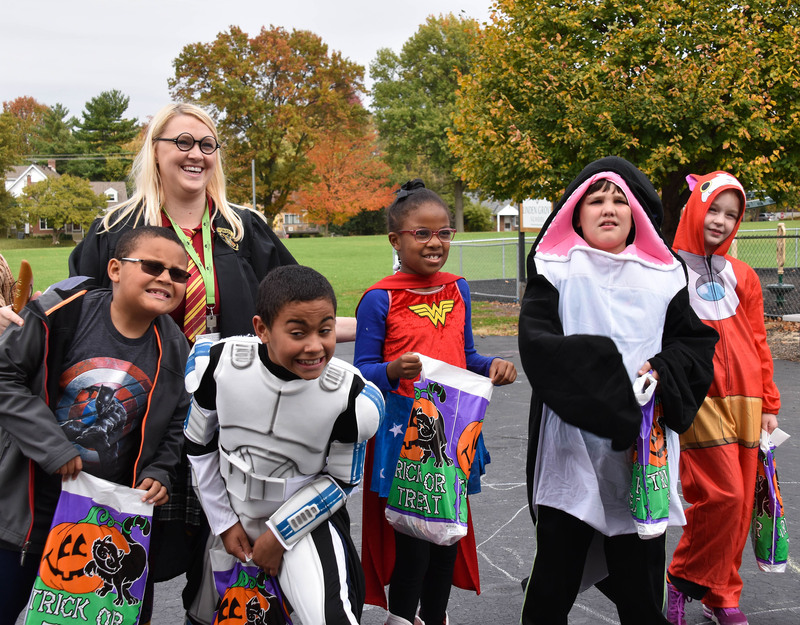 A fun component of this program is our “CARES TICKET” earning system – students receive tickets when they demonstrate the skill for the week and then use their tickets to win prizes. Progressive! 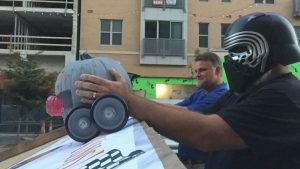 Partnerships! Potential and Parents! The crux of what’s in store for another great year at LGS. Noah Broerman and Christian Fuson explore some of the robotics equipment in the new STEM Lab. This addition to LGS will offer hands-on learning activities in Science, Technology, Engineering, Mathematics. Our Progressive nature is one of the reasons we have fantastic student re-enrollment and staff retention. With dollars raised from last year’s Signature Event we transformed one of our classrooms into a STEM* Lab. We also implemented a new full time position: Sensory Coordinator. 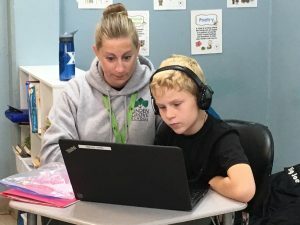 As the only school in the Greater Cincinnati Area to offer this position and likely the only school in the nation, we thank Dawn Klinczar, veteran LGS Teacher of 16 years, for stepping into this unique role. Strong Partnerships elevate our services and allow us to meet more needs within the community. 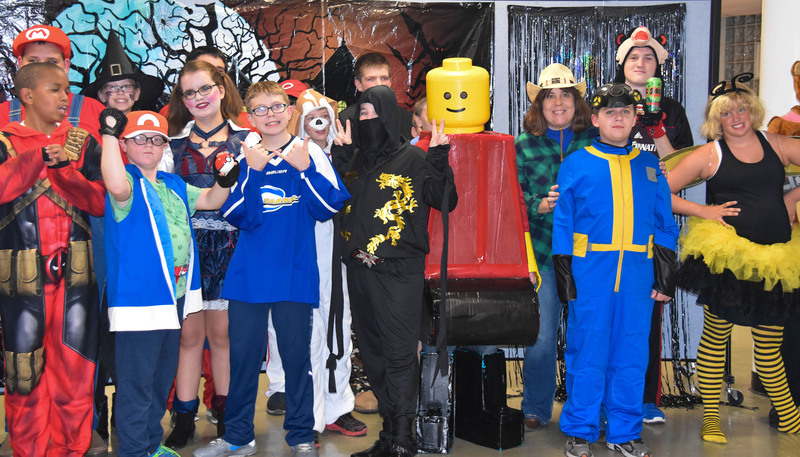 Our relationship with The Children’s Home of Cincinnati Autism High School continues to grow and in September LGS started providing afterschool clubs to CHOC students, including Bowling, Robotics, and Resilient Teen. 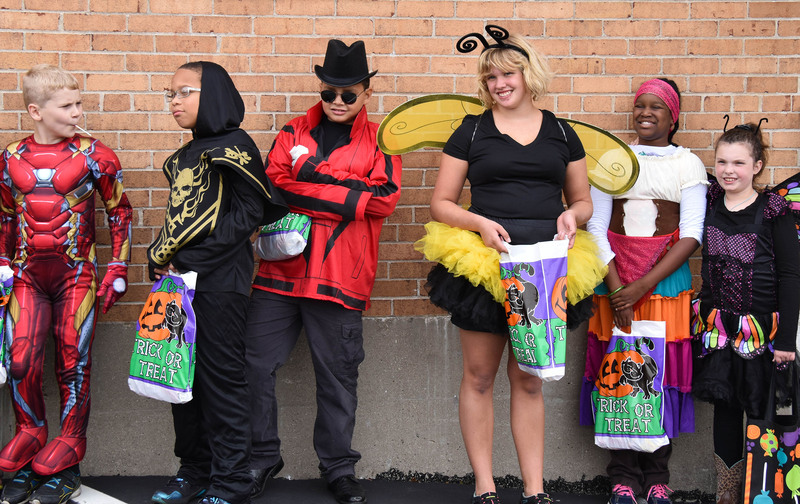 We are also partnering with Montessori Academy of Cincinnati to provide reverse inclusion opportunities for LGS students and service-related opportunities for their students. 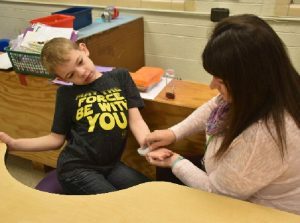 Gavin Duryea relaxes in a brush therapy session with Sensory Coordinator Dawn Klinczar. Brush therapy helps normalize sensory processing, increasing students’ ability to function within the school setting. Potential…our students’ full potential is always at the forefront. 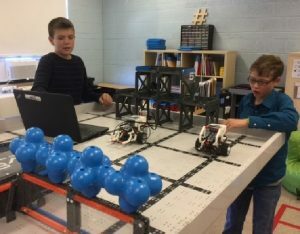 Given many of our students’ natural inclination to tinker, we hope to develop a School Makerspace which will provide hands-on, creative ways to encourage students to design, build and invent. We hope for this initiative to be supported through a grant and/or donations. 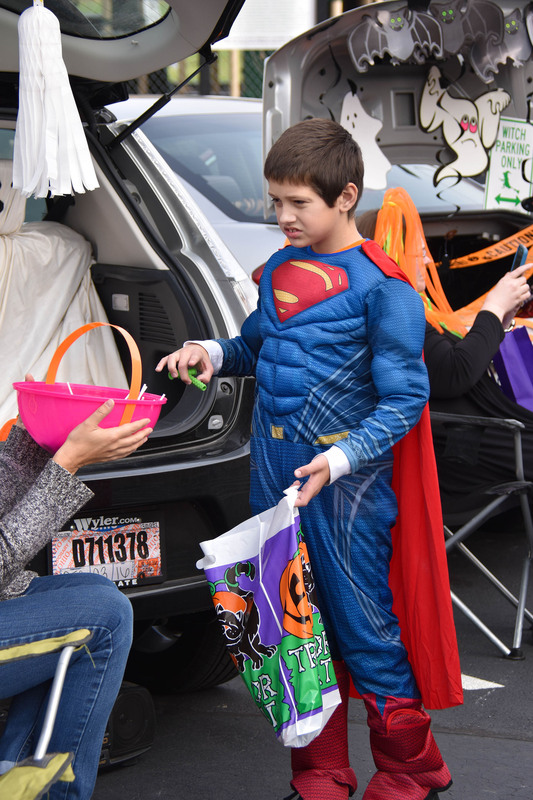 Our Parents work exhaustively to support their children and LGS, and this year we want to celebrate with them and recognize all they do. 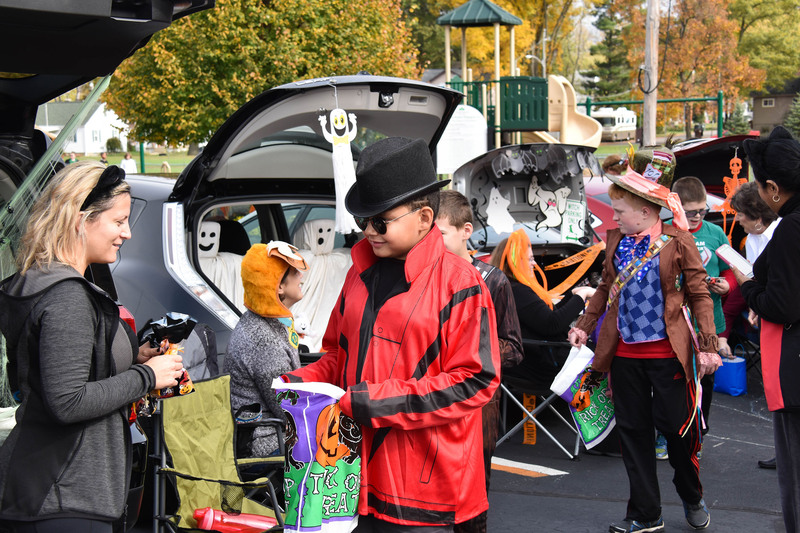 Already parents have been building furniture, planning fun social events, chaperoning field trips, cleaning the building, serving as board members or on board committees, and much more! 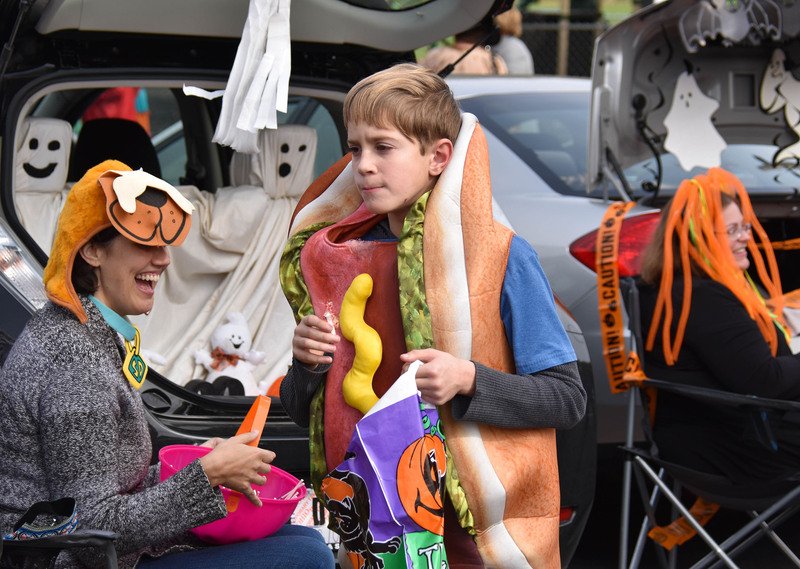 In return, our staff are preparing new Parent Evenings that consist of samplings of LGS specialized programs, make-it and take-it workshops for at-home strategies, and most importantly…a monthly Parents Night Out! So LGS community…welcome back to another year of success. Don’t forget to dot your i’s, cross your t’s, and proceed with our 4 P’s!